For our readers who would like to get discounted travel tickets or tour deals you might want to visit the Travel Sale Fair 2016! Yes, the Travel Sale Fair 2016 will be happening this November 4-5, 2016. This is the second year of holding the Travel Sale Fair wherein airline companies offer promo flights and tour operators are giving discounts on tickets and tour packages. Alongside with the Travel Fair is the Trendsetter’s Bazaar which will be showcasing travel gears, travel knick knacks/gadgets and outfits. 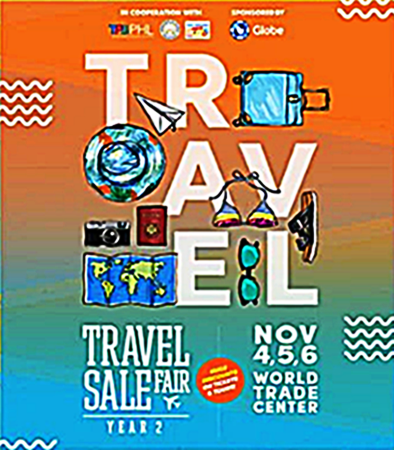 The Travel Sale Fair and the Trendsetter’s Bazaar will be held at the World Trade Center, Pasay City. The trade fair opens from 11AM to 9PM during the 3- days event. Per organizers, the Travel Fair will showcase 100 airline companies, tour operators, recreational destinations, hotel and resorts and other business exhibitors. From this travel sale fair, you can book for the cheapest flights to your coveted vacation haven, cheaper hotel accommodations and resort vacation packages. Guided tours to many amazing destinations are also on discounted rate, courtesy of the many travel agencies and tours joining the event. Joining the travel fair are airline companies: Philippine Airlines, Air Asia, Skyjet Airlines, Cathay Pacific and Dragon Air. Other exhibitors are hotels and resorts, travel agencies and tour operators like Patio Pacific Boracay, Diamond Hotel Philippines, Two Seasons Resort, Pan Pacific Travel Corporation, Rakso Air Travel and Tours, Ark Travel Express Inc., Reli Tours, Trafalgar, Enchanted Kingdom and many more. Rustan’s Marketing Corporation and United Limsun International Trading Corporation (Pacsafe) are also among the exhibitors. Before going to the travel event, prepare your checklist of: top destination choices, your travel budget, preferred travel dates, hotel accommodations or tour packages. The Travel Sale Fair will be in World Trade Center Hall B &C while the Trendsetter Bazaar will be in Hall A. Are you rooting for a vacation in Batanes? Skyjet Airlines which is among the exhibitors has these promo fare offer: Manila to Batanes promo fare at P2,2597++, seat sale Manila to Boracay is as low as P1,697++ and Manila to Coron sale flights at P1, 957++. All Skyjet promo ticket rate are good for one-way travel. Entrance fee for the Travel Sale Fair is P100/person. If You are a Citi Bank credit card holder, present your Citi credit card and a valid ID at the ticket booth and you will get 50% off on entrance fee. Come in early with your family and friends to get the best travel deals. Airlines have limited promo fare tickets per destination. Bring your passport /visa and other necessary travel documents. To help you check on your travel dates, check the List of Philippine Long Weekends in 2017 HERE. For more travel updates, airline promo fare and PISO FARE 2017, LIKE and FOLLOW PISO FARE TICKETS in Facebook!